Now I want to introduce you with the ball that is using new technology allowing to glow in the dark. 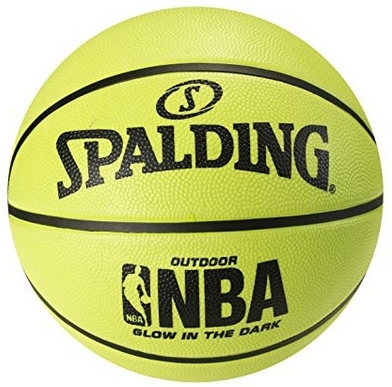 This basketball is made by Spalding and is called simply Spalding NBA glow in the dark basketball. It’s a great replacement ball if love playing in dark. It’s really cool to have such ball in your arsenal and in combo with glowing net on your hoop it’s even better. I can say with confidence that Spalding outdoor basketballs never fail with grip and nice bounce characteristics, this ball is no exception. It bounces well and grip is nice to experience the same gameplay as you would use any other mid-level ball that is not glowing. Basketball is covered with special rubber cover that glows in dark, the thing is that ball charges during the day to be ready for the night play. Don’t forget to turn the ball from time to time so all the surface of the ball would get a direct sun light at least for a few minutes. The ball doesn’t use any electric gadgets or any kind of LED lights. It’s glowing material the ball is covered with causes this effect. You may already have a clue that this ball is for outdoor use because of specifications. It’s available in two sizes: size 6 and an official one – size 7. Maintenance is easy, all it needs to be charged is just leave it in direct sun light to charge itself. It’s really fun to play basketball with your kids using this ball. So if you are looking for a gift to your kids this is a good choice. It lets you to enjoy family fun time after the sun goes down. Here is the video of similar product and guy shows us how it works, at first he let’s it charge in the day light and then takes it to the dark room, however I assume it’s not Spalding ball so this one we review here should be way better. The main advantage of such ball is his main characteristic of glowing in the dark. Actually it you will start to see the difference right at the time the sun starts to fade and I must say it looks cool and kids love it, actually even me, an adult man, I love to shoot around with and a nice view of accurate shoots in the dark looks cool and I enjoyed playing. This ball comes deflated from most of the retails, so if you are concerned about that you should check this before buying from your favorite shop. I had this ball for a couple of weeks already and it holds air well and kids enjoy it in the evening shoot outs. During the day time it’s just a regular basketball. All the magic starting to show up in the evenings and night time – this is the time then you bring this ball to play. Nice ball for kids as they love to see such effect on the ball, this effect motivates them to be active and play with it way longer than they would with regular ball. It’s fun to play with this basketball. However you should never forget that it needs to “charge” during the day time to get the best experience after the sun goes down. The price is also reasonable and comparing to similar products this ball wins, because it’s made by Spalding and this company makes really good basketballs for outdoor play.